Artist Godwin Atta Geoman uses expressive brushstrokes to depict a multicolored, vibrant market scene. Working in the impressionist style, the artist paints with pride in his African origins, inviting the viewer to experience a candid moment in Ghanaian life. "Each work is imbued with a sense of tradition and heritage. Nature and all that surrounds me is a neverending source of inspiration." Godwin Atta Geoman hails from a busy urban area, where he was born on May 16, 1977. He began painting at the age of ten, eventually studying at one of the country’s most respected art schools. 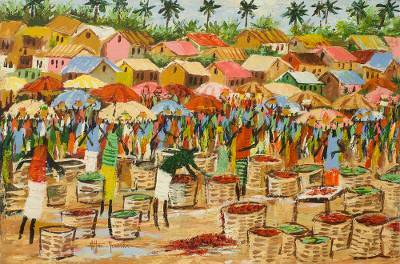 "My paintings tend to depict scenes of villages, beaches, markets, and African people. Each work is imbued with a sense of tradition and heritage. Nature and all that surrounds me is a neverending source of inspiration," the artist tells us. Rendering images in oils, acrylics, and watercolors, his pieces have been exhibited in several prestigious galleries throughout Ghana. "I sign my work as 'Atta Geoman' to emphasize my African origins. 'Atta' means 'twin' in the Akan language."